Today is another story day! Yay! I hope you like this one, I've actually been looking for it for a while. I vaguely remember hearing it many years ago. The website that this story is from didn't list a specific First Nation tribe that it belonged to, but I'm fairly sure that it is Seneca (part of the Iroquois) because of the name of the Frost Spirit, Hatho. I hope you enjoy! Back in the old days, Bear had a tail which was his proudest possession. It was long and black and glossy and Bear used to wave it around just so that people would look at it. Fox saw this. Fox, as everyone knows, is a trickster and likes nothing better than fooling others. So it was that he decided to play a trick on Bear. It was the time of year when Hatho, the Spirit of Frost, had swept across the land, covering the lakes with ice and pounding on the trees with his big hammer. Fox made a hole in the ice, right near a place where Bear liked to walk. By the time Bear came by, all around Fox, in a big circle, were big trout and fat perch. Just as Bear was about to ask Fox what he was doing, Fox twitched his tail which he had sticking through that hole in the ice and pulled out a huge trout. "Greetings, Brother," said Fox. "How are you this fine day?" So Fox went back to the ice covered pond and what do you think he saw? He saw what looked like a little white hill in the middle of the ice. It had snowed during the night and covered Bear, who had fallen asleep while waiting for Fox to tell him to pull his tail and catch a fish. And Bear was snoring. His snores were so loud that the ice was shaking. It was so funny that Fox rolled with laughter. But when he was through laughing, he decided the time had come to wake up poor Bear. He crept very close to Bear's ear, took a deep breath, and then shouted: "Now, Bear!!!" Bear woke up with a start and pulled his long tail hard as he could. But his tail had been caught in the ice which had frozen over during the night and as he pulled, it broke off -- Whack! -- just like that. 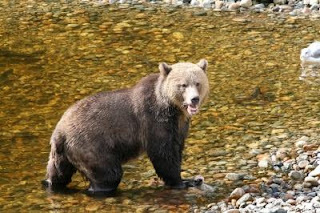 Bear turned around to look at the fish he had caught and instead saw his long lovely tail caught in the ice.